English pears are at their best in November and this dessert makes the most of their naturally sweet flavour. Use Comice, Concorde or Conference varieties. Preheat the oven to 200°C, gas mark 6. Cut the pears in half, peel and remove the core. Lightly butter a shallow ovenproof dish large enough to take the halved pears in one layer. Arrange the pears, cut sides up, in the dish and pour the orange juice over and around them. Beat together the butter and sugar until softened. Beat in the orange zest and ground almonds, then stir in the egg white. Spoon a little mixture into the cavity of each pear, then scatter the flaked almonds over. Cover the dish tightly with foil and bake for 30 minutes. 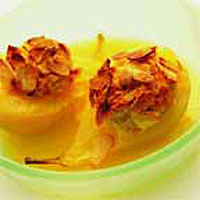 Remove the foil and return to the oven for a further 20 minutes, until the pears are tender and the filling golden. Serve with low-fat fromage frais or yogurt. To remove the core neatly from each pear half, use a teaspoon or a melon baller. Serve these pears warm or cold. They also reheat well if you have any left over.